The Windsor Solar Post Cap includes 4 high output surface mount LED's that are hidden from view. When night falls, this one of a kind design casts an array of light onto all four walls of the post cap and surrounding area. This truly unique style is designed to fit over an existing 4" x 4" or 3.5" x 3.5" post (3.5" x 3.5" adapter included). • Designed to fit over an existing 4" x 4" or 3.5" x 3.5" post (3.5" x 3.5" adapter included). 5 x 5 Adaptor for Item Codes - SL4400, SL074, SL078, CC044. Easy as ever installation. Great product. Even provides light at night, when we have cloudy day's. Excellent product. ProsI love solar products. I have purchased many over the years. This company provides the best quality products. Best UsesI use it on top of my gate post. What is it made of? Will the color fade? This post cap is made out of PVC. This post cap is designed with multiple layers of PVC to prevent fading, warping, and cracking. If you have any additional questions, please let us know. Thank you for your inquiry! The Windsor is only available in the color depicted in the image. Thank you for your inquiry! Does this light come in black and if not do you have some with a high lumin that does? Thanks! The Windsor Solar Post Cap is only available in a White finish, and features an output of 10 lumens. This features the highest lumen output in comparison to the average lumen output of 2.4 lumens. The black Solar Post Cap lights can be found here: http://www.earthtechproducts.com/solar-fence-post-cap-light.html Thank you for your inquiry! 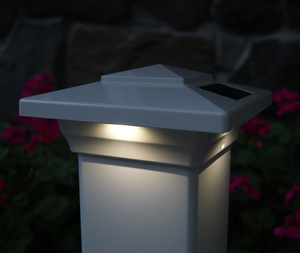 Yes, the Windsor Solar Post Cap Light is designed to fit over an existing 4" x 4" Vinyl Post. We are more than happy to accommodate larger orders. If you are interested in a volume discount please contact us directly at 877-548-3387. Thank you for your inquiry!